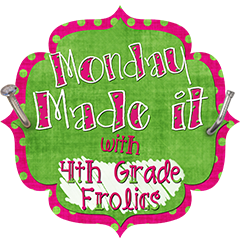 It is time for another Made It Monday, classroom freebies, and don't forget to read about our giveaway just for voting for Give With Target! I finally got my Whole Class Writing Journals put together! There are about 20 total. I plan to model writing to the topic/prompt as I put each one in the writing center. I just laminated the cover and put writing paper (with a space for a picture) in it that is appropriate for first grade. Best part is that, along with our other class writing books this year, every kid will get to take home a book at the end of the year with writing from the other students in it. These table markers were pretty easy to make. I saw them here on Pinterest a couple of months ago and then one of my first grade teammates made them and I totally had to do it. I just made the Poms and then used the stars (that's my theme) from my star theme packet to hook to the bottom. My second project was my birthday pencil pot. Seriously, if some non-teacher stumbles across this post they are going to wonder what is wrong with me that I am so excited as to post about some pencils in a pot. It doesn't take a whole lot to entertain me. You can find the little flowers here for free! Next, for our classroom freebies for Manic Monday! Stephanie created a Transportation Home freebie to keep track of students when it's time for dismissal. This is always helpful when there is a substitute teacher. Always be prepared! 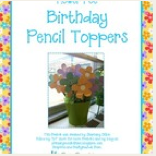 Stephany has her birthday pencil flowers (from her Made-It-Monday) up for free in her store. 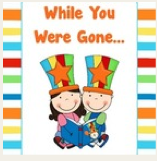 Kathi has up a "While You Were Gone" in her circus theme. Another way to be prepared for someone being absent! Have a great week! One last week for us before school starts! Don't forget our Rafflecopter below. I'm with you on the whole, running out of time to make all my Pinterest projects!! The birthday flowers turned out super cute. Your kids will love them Stephany! That darn clock just keeps on ticking! Oh, the Pinterest projects! Thanks for posting this, it reminded me to add birthday goodies to my "to do" list! Thanks for the free download of the flower pencil toppers! I've been meaning to complete that project this summer, too! Now I have no excuse!